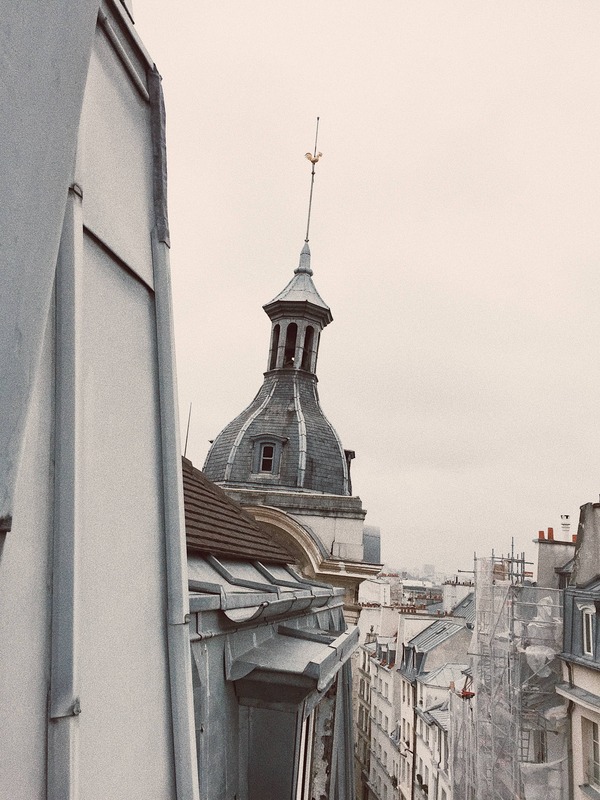 Our last days in Paris brought us to the coziest little hotel in Bonne Nouvelle. It wasn’t planned, we ended up here on a whim. The hotel was tucked away on a quiet street. It was Sunday morning, and it had just rained. The church bells were ringing through the empty streets, and I couldn’t have been more in love or more at home, there in that moment. It was so quaint, quiet, and warm. Not like the somewhat old and drafty, street-noise-ridden places one might equate with this city that never sleeps. It felt like we had the whole hotel… no, the whole neighborhood to ourselves! The only person we saw in the hotel was the lovely lady concierge, who was so helpful to us. It was one of the moments we got to slow down during the craziness of Fashion Week. 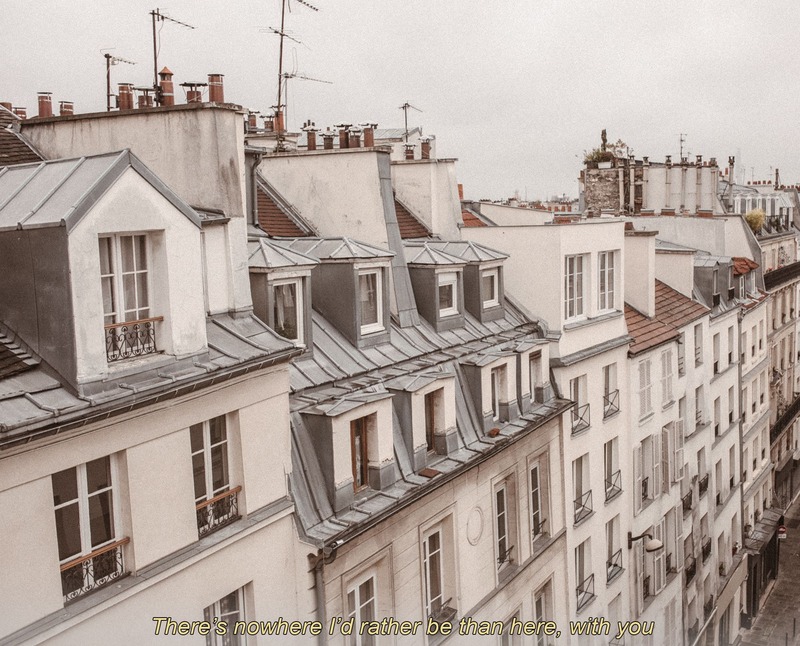 I spent a while leaning out the window, staring out across the rooftops, watching the Eiffel Tower disappear and reappear again from the low clouds. Parisians came and went from their windows. Because window life is an actual thing in this city. Below, a young man smoked a cigarette out the window across from us. And when he left, his lover appeared to cut fruit and cheese on the table. 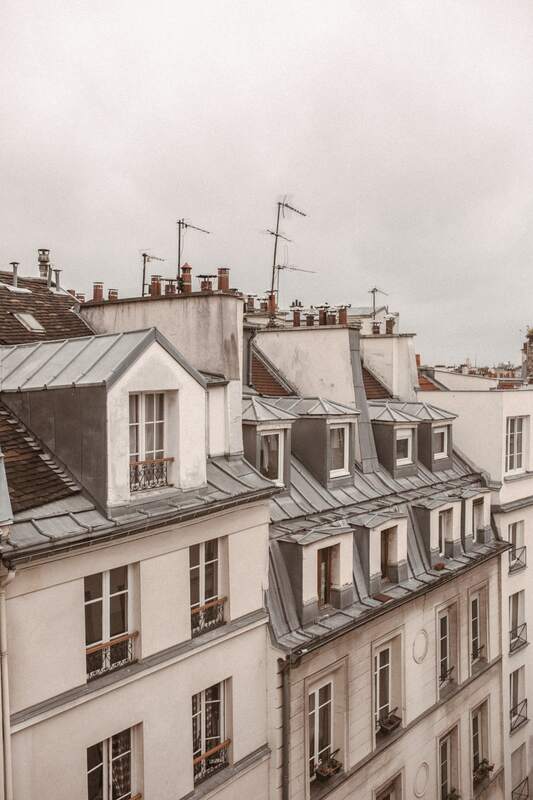 Pigeons cooed on windowsills, and voices echoed softly down the cobblestone streets, but the somber sleepiness of Paris on Sunday filled the rainy air. We had to run for baguettes and cheese, of course, but on Sundays almost everywhere is closed in Paris. So we had to forgo the iPhone GPS and follow our instinct. Or, well, stalk people who were walking the streets with baguettes under their arm, until we found our way to the nearest Boulangerie that was still open. We were pretty stoked, considering we didn’t bring any food with us to our hotel, and had to head to a fashion show in the evening. The baguette expedition led us to Rue de Petits Carreaux- one of the prettiest streets one thinks of as the iconic Paris. Well, Paris if full of so many types of areas and cliches. But I suppose this is the vibe that sings the same frequency as my soul, because I was so utterly happy. The area really took hold of my heart with it’s timeless vibes, and I’m so glad we got to experience it. Our baguette adventure and a walk through the streets of Bonne Nouvelle will be coming up next to the blog, so stay tuned! Read More to see the photos from our Parisian window, and get the outfit details at the bottom of the post!